Where Have All the Shooting Stars Gone? 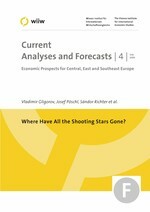 The report analyses recent economic developments and short- and medium-term prospects of the countries of Central and Eastern Europe, Southeast Europe including Turkey, as well as Kazakhstan, Russia, Ukraine and China. Separate chapters present an overview of developments in the European Union's new member states and in the future EU member states of Southeast Europe, and deal with the changing role of the IMF in the region and the latest developments in foreign trade.